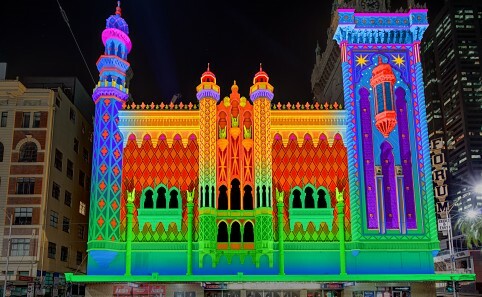 This Saturday night at 7pm Melbourne’s CBD will be transformed into a labyrinth of pop-up light, art, film and music exhibitions that will run all night long. For one night only, Melbourne will become a wonderland covering laneways, streets, buildings, underground car parks and public buildings. The only way to describe it would be like looking at Melbourne through a kaleidoscope while on acid… so I’m told. With over 40 sites and 300 acts I’m not going to try and tell you about all of them, but I will try and pick out the good ‘uns. Really that title should just about do it for you without me saying a thing. Degraves Street is an iconic laneway in Melbourne which is normally a ghost lane at night, so this little Jazz Stage will be a great shout. Not only will there be Jazz flute playing from 7pm – 6am the restaurants will be joining in on the fun and staying up late. Leigh Barker’s The New Skieks kick things off and Bob & Steve Sedegreen Trio will bring it home. Release the inner actor in you with the chance to step in front of a camera and deliver classic one-liners from Hollywood legends such as Schwarzenegger, De Niro and everyone in between. ACMI presents the night with props, auto cues and movie set lighting. Since I was a boy I’ve wanted to stand on camera and say “It’s not a tumor”. Forget Valentine’s Day? Miss your anniversary last week? What if you could send a message of love that would magically float along the Yarra River? Well now is your chance. Just text in your soppy words and they will be displayed on the spheres as they cruise down the Yarra. The spectacle will not just be in the Yarra, it will be all along it with the ultimate outdoor gallery at Birrarung Marr. The steps of Flinders Street station will be swept clean of the Gothic kids that normally inhabit the area during the day. In their place will be an amazing stage with free concerts from would you believe, Bombay Royale (11:20pm), Cat Empire (2:10am) and Eagle and the Worm (5:10am). What a backdrop it will be. For me, the museum is certainly not a cool place to take someone on a date. I’d rather not reveal how dumb I am until at least after the fifth date. So this one will be my chance to visit the Melbourne Museum and actually be pretty excited. A bunch of the dinosaur and reptile exhibitions within the museum will be open, but all the lights will be out and there will only a single beam to light your path…. I’m scared just thinking about it. For the absolute best view you have ever seen of Melbourne, this is the place to be. Melbourne will be lit up like a Christmas tree and she’ll be looking more gorgeous than ever. Thankfully it’s staying open all night and all morning so if you fancy a sunrise, I’d suggest you get up to the Skydeck just before the sun rises.